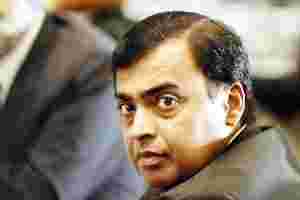 A file photo of Reliance Industries chairman Mukesh Ambani. Mumbai: Reliance Industries (RIL) said on Thursday it has bought a minority stake in Terra Power, a US-based nuclear-technology design and engineering company, through one of its subsidiaries. Reliance Industries chairman Mukesh Ambani will join the company’s board, which includes Microsoft chairman Bill Gates and Silicon Valley venture capitalist Vinod Khosla, the Economic Times had reported earlier in the day. Reliance, India’s most valuable company, controlled by Indian billionaire Mukesh Ambani, has outlined plans to spend $4 billion to $4.5 billion by 2014 on three US shale gas joint ventures it entered into last year. Last week, a company official told Reuters that it is scouting for oil investments in the Americas as it looks to increase the stake of crude production it owns to feed its refinery, the world’s largest.